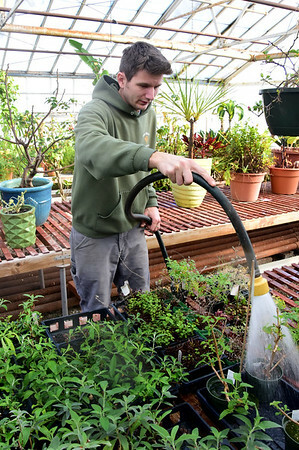 Tyler Annichiarico waters plants in the warm room of Mount Williams Greenhouses in North Adams on Thursday where many varieties of plants including tropical plants and cactuses spend the cold weather months. The greenhouse rents space in the greenhouse for those looking to house their outdoor tropical plants during the winter, if people are unable to house their tropicals inside due to space or other consideration. Annichiarico says they have also taken in "stray" plants that don't have a home. Thursday, January 31, 2019.